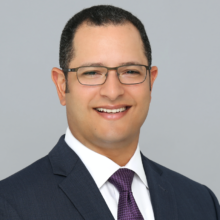 Dr. Rodriguez has devoted his career to perfect his minimally invasive techniques receiving early-on in training the recognition of Outstanding Laparo-endoscopic Resident. He went on to do a Fellowship in Minimally Invasive and Bariatric surgery at USF where he performed hundreds of complex bariatric revisions and primary weight loss surgeries. Since then he has dedicated his practice to minimally invasive surgery including complex hernia repairs, colon resections, hiatal hernia and reflux procedures as well as weight-loss surgeries. Dr. Rodriguez graduated with honors in 2003 at the Pontifical Catholic University in his hometown of Santiago, Dominican Republic. He completed his residency in general surgery at Huntington Memorial Hospital in Pasadena, California. He is a Diplomate of the American Board of Surgery, a Fellow of the American College of Surgeons and a member of the American Society of Metabolic and Bariatric Surgeons. Dr. Rodriguez holds an appointment as Clinical Associate Professor at Florida Atlantic University.